As a recognized “foodie” I have anxiously awaited the opening of the Liberty Public Market. The one thing I miss most about living in the Bay Area is the “Berkeley Bowl” – a converted bowling alley turned into a multitude of food shops. 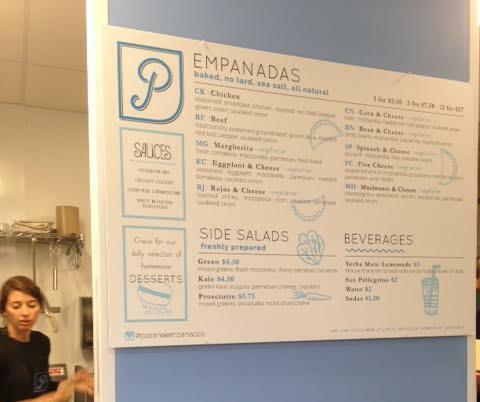 From all I had heard, this new venture was a cross between the Bowl and the Seattle “Pike Place Market.” Even at my age I have not yet learned not to expect too much. Perhaps it was because I just had my income taxes completed and realized that my outcome far exceeds my income; perhaps it was because of the number of tourists roaming the halls; perhaps it was because it was nothing like the Berkeley Bowl, that I became disenchanted with what I was seeing; perhaps it was just the high prices of everything, but whatever it was – I was disappointed. 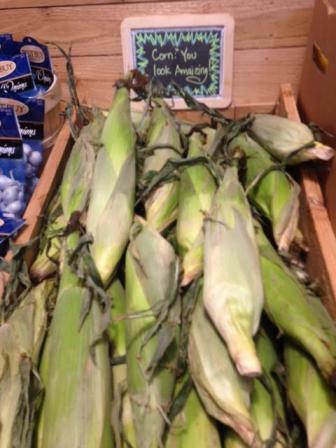 For example, at “Garden Fresh” a large ear of white corn was $1.75 an ear; Haas Avocados were $2.15 each. I didn’t open the ear of corn, but I can tell you that the Avocados were not particularly large; and even if they were grown “organically” they are not worth that kind of money. 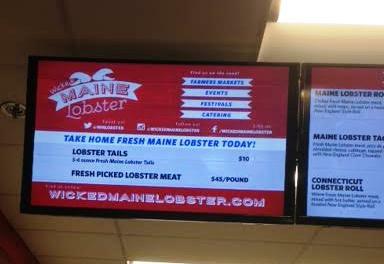 However, I was impressed with the $10 price of Maine Lobster tails for a 6 oz. fresh tail at the “Maine Lobster” stand. The fish market had a huge array of whole fish available, and most of the places where the fish were caught were marked, but they had not yet received their final clearance from the Health Department so you had to buy the entire fish – and fillet it yourself -. The Mahi Mahi was about 25 pounds and I had to ask where it was caught. (I will not eat or purchase farm raised fish.) The owner said it was caught in the Sea of Cortez; when I pressed where, he said it was down by La Paz. The company expected their final approval later this afternoon and would then be able to filet fish, offer breakfast, etc. “Venissimo Cheese” was not open when Irene and I walked by, but there was a full array of cheeses available in the display cases. “Scooped” Ice Cream was tantalizing. 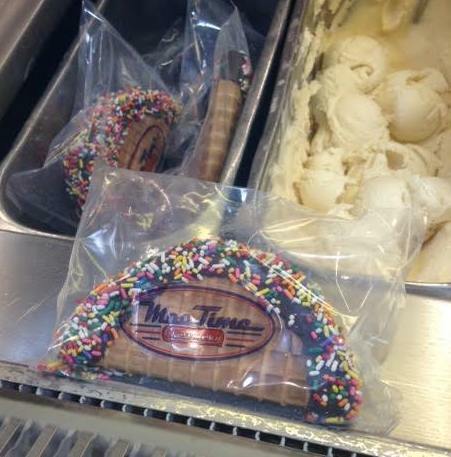 But they offered, among other things, “Ice Cream Tacos” for $5.25 and it was already prepackaged in cellophane. Perhaps their scoops were of a better price, but I was turned off. 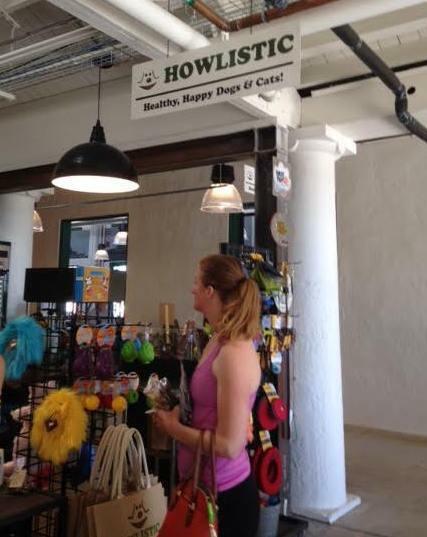 I was already familiar with “Howlistic” – a healthy animal store. The prices were about the same here as they are in their Hillcrest store. The gentleman I talked to was friendly. It would have been nice to be offered a free sample of something for my dog. And I must say something about DOGS. I have one. I love him. BUT he does not belong on a shopping trip with me, particularly where there are food stuffs being offered. Seeing all the people with their dogs walking down the aisles makes me realize that I should never buy anything on the bottom shelves!!!! One thing I am looking into has me somewhat concerned. 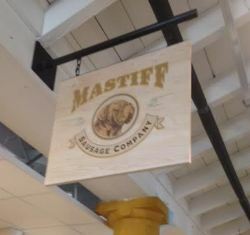 “Mastiff Sausage” was in the process of filling up their shelves when Irene and I walked by. But the lady pulling the cart of sausages also walked by us and the sausages were exposed to every and all people in the area. I didn’t expect to catch anything from the sausage, but what if we sneezed as she walked by? Or coughed? It doesn’t seem to me that an item that I am going to purchase should have the “exposure” that these sausages had. I took pictures of many of the booths; some were covered and I could not do so; some I have pictures of but no explanation. Go take a look and make your own decision. I was so looking forward to this new venture. To say that I was disappointed is putting it mildly. Would I go back? Sure. To purchase anything? No. It is way too rich for me and once the newness wears off there would not be any reason to go back. I do not think that tourists will spend a great deal there either. I can’t see them buying fresh meat – where would they cook it? – the same for fresh vegetables or fresh fish. Maybe if I had a higher income it would be a possibility, but it is way out of my price range on almost every item. But it is a fun place to look – not the kind of “window shopping” I enjoy. clarification from the health department. Gloves were a requirement but that was repealed in 2014. Good being transported from one area to another must be covered while in transit. These were not. Liberty Station is a world designed for people of a certain income. It is designed so that people of a certain income will be shielded from the regular folk, it is an island of upper middle class pursuits. Why a fish market when Pt. Loma Seafoods is so nearby, because it allows these folks to buy their fish within the confines of this little world and not have to stand in the crowd of regular people buying fish there. Liberty Station is designed to be a city within a city, it is not a real part of Pt. Loma. 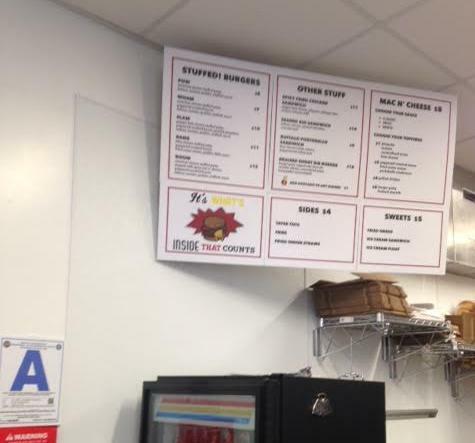 The pricing seen is only competitive within the confines of Liberty Station, as Ms. Curry has shown, outside of Liberty Station, these prices would not fly. I’m sure the people living there love this and there are nice folks there but it is drawing money away from the rest of Pt. Loma rather than contributing to it. To me, the whole thing is a failed venture. 1) “Regular” preople go to Point Loma Seafoods? Point Loma Seafoods is a tourist trap. Parking is a pain. 2) The homeowners living immediately outside Liberty Station (Loma Portal, FleetRidge, Wooded Area, La Playa) have considerably more money than those who live in the townhomes and Lincoln Military Housing in Liberty Station. 3) There is a considerable amount of things in Liberty Station that are worth going to for “regular” people. Trader Joes, Vons and getting growler fills at Stone (which costs about 2/3 what Pizza Port would rip you off for). So there goes your theory. Pt. Loma Seafoods is a tourist trap? Howe long have you lived here Mr. Christo? How do you explain the crowds all year long? You need to consult a map. Some parts of Fleetridge and Loma Portal are near Liberty Station but most of those areas are not “immediately outside” Liberty Station. The Wooded Area and LaPlaya are not anywhere near Liberty Station. Trader Joe’s for regular people? I don’t think so, it is expensive as well. Vons? Sure but why fight the traffic to go there when there are other markets outside Liberty Station. Vons moved there to serve Liberty Station, it used to be outside that complex. Stone? I love Stone beer but have you looked at the menu prices at their Liberty Station place? I’m sure Pizza Port appreciates the slam but at least it is accessible and affordable and always packed with young people. There goes what theory? I wasn’t theorizing but if I was, you surely did not shoot anything down with these comments. Your comments are totally out of touch with the pulse of Point Loma. Many local residents from outside of Liberty Station shop and are entertained at Liberty Station. Yes, visitors too, of course as Liberty Station is becoming a regional destination. The businesses at Liberty Station include a unique mix of retail food and grocery establishments giving us more choices. Yes, we have a Vons, Yes, we have a Trader Joes. Yes we have the Liberty Station Marketplace. And we have other choices outside of Liberty Station like Ralphs, Sprouts, Stumps, Grocery Outlet, OB Peoples and Point Loma Seafoods. When I am looking for a value on vegetables and meats, I like to check out Sprouts and Stumps. Ralphs and Vons are are a value due to the size provide sales on packaged grocery products. 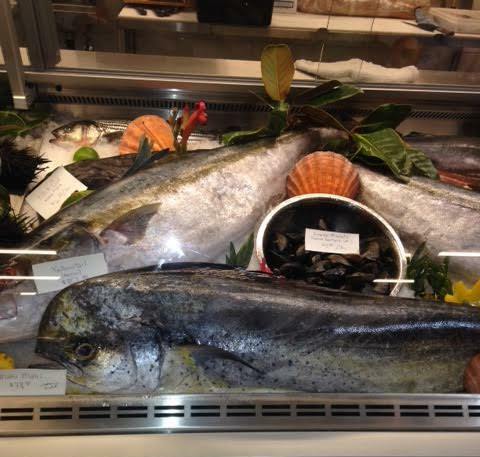 When I want a special meat or fish product I will check out the Liberty Station Marketplace at Point Loma Seafoods. A soon a Jensens. Your opinion of how in or out of touch you think I am with Pt. Loma is just an opinion, nothing more. I would disagree of course. The rest of your piece sounds like a promo for the McMillin group, which would be expected from you. That last paragraph sounded like it came right from McMillin’s PR folks, it would be perfect on a brochure with a bunch of folks raising their wine glasses and sporting fake smiles. I realize this is the OB Rag and unless I don’t shave my armpits or am not a Bernie Fan then I probably don’t belong in this forum. But it’s funny how the modern hippies can be so divisive. Have you forgotten about the One Love from the 60’s. Does my income bracket truly make me as evil as you say. Should we all have to toil in the fields and come home stinking to high even in order to earned our keep? Bernie would be shaking his finger at you in disgust and if he knew how he would say SMH. I’m guessing, by trying to decipher your comment, that you probably don’t belong on this forum as you mentioned. You start by insulting the hygiene of folks who read The Rag and some of their politics. Then you say “modern hippies” when there is no such thing and comment that one of those has been divisive. Who were you directing that at? One Love is from a reggae song and the 60s were not all love by any means. But the most puzzling part were your comments about income. Who said anyone was evil because of how much money they make? The “toil in the fields” comment makes no sense at all. And why would Bernie be shaking his finger at anyone? And what is SMH? That seems pretty judgmental and divisive there Jeff as well as contemptuous words for a whole slew of folks based solely on a level of income. Although I’ve been frequenting Point Loma Seafoods for about 20 years I never realized the same time I was buying $20.00 a pound Ahi, I was also lowering myself and my standards by stepping foot in a place outside of my social status. Thank you for bringing this to my attention Jeffie. Tim to return back to my “little world” and continue on with my superficial pursuits and remove myself from the “regular folk” you claim your allegiance with Jeffy. You can always tell that you’ve touched a nerve when people start trying to insult, in this case by playing with my name. And, you didn’t even get that right. It’s Geoff, Geoffie, and Geoffy. No “J” in my name. You are obviously reading my comments through the filter of your own lens. I am not commenting on people, I was commenting on a place. It may sound judgmental because I was expressing my lack of fondness for insulated places like this. Divisive? That I don’t get. If you take another look at what I wrote, I said there are nice folks living there, I happen to know several. And you have taken pains to let us know that you are of a certain economic status, which you started by bashing The Rag and the people who read it. My comment had none of that. So, perhaps it is best you don’t venture too far outside your tribe, you may get a little dirty down here with us regular folk. I love Pt. Loma Seafoods and will go there! But if I can feed my kids, pick up milk, eat a burger, get some exercise, and buy a hammer and nails, in one place, that’s where I’m going. I’ve also found cheaper items at Trader Joes than in Vons. Actually, you can do all of that at the Von’s shopping center on Midway, except you’d have to go across the street to Home Depot to get the hammer and nails. And there is plenty of parking at both locations. I checked out the Market yesterday along with a friend and for the most part agree with your review. Nice for a lunch once in a while but not for everyday for shopping. I would have to agree with Ms. Curry’s assessment. It was over-hyped when it was suggested it was like Seattle’s Pike’s Place Market, raising expectations beyond what was delivered by Liberty Station’s Public Market. While there appeared to be high quality, the prices were also high and the selections are limited. It’s more accurately a micro-boutique approximation of the markets found in Seattle, Berkeley and Pier 39 in San Francisco. The April issue of Money Magazine had a Best in Travel 2016 section. San Diego was first on the list with a nice photo of Sunset Cliffs Park. I was surprised to see Liberty Public Market highlighted! They also mentioned the Pearl as a retro place to stay. I visited the market last week and had trouble finding a place to park and room to walk. It was crowded and expensive. Traffic from Lytton is a continual stream of cars entering Liberty Station. I too was disappointed. The fact that Liberty Public Market was highlighted in Money Magazine is support for my point. Who reads Money Magazine? McMillin’s PR department working overtime. My wife and I went there and we were disappointed. She is from the Philly area and we were hoping for a sliver of the Philly market. Having been there with her myself, we also had higher expectations. From the minute we saw the sign out front that looks like they stole it from the seattle market we were skeptical. It’s basically just an expensive place to get lunch. The markets are a good idea but I don’t see them doing well. I did get a burger from stuffed and it was good, and not that expensive. I just don’t see the market being any more than a tourist trap. A good idea in theory and the execution isn’t that bad, but half of those places won’t last. If you’re referring to the Philly market in the old train terminal, that place is terrific. All kinds of great foods from everywhere, fantastic smells, and an international crowd milling about. Very authentic. I could not imagine that same scene at Liberty Station. A very good article. The one thing I totally agree with you on is the dog situation. Way, way too many dogs in there. Non (real) service dogs aside, dogs have no place in a market. Period. When I was there I saw a woman sitting at the raw seafood bar. The little dog in sitting in her lap was having a great time licking the counter. I watched this go on for several minutes, no one stooping her or her dog. Keep that image in mind next time you are there. Typo…. I meant to say Real service dogs aside, dogs have no place in a market. It should just be called Liberty Station Market. We all know it’s public. lol. I’m sure Jimmy wouldn’t mind at all. I’ll bet he would appreciate it. I was reminded of Gertrude Stein’s comment “there’s no there, there”. (Everybody’s Autobiography (Random House 1937, p 289) when I recently visited the Liberty Station Market. Spoiler alert – growing up in Cleveland, Ohio and being taken to the now 100 year West Side Market (Centennial featured on The Today Show) my expectation like other commenters was much higher than the reality. Size is small and narrow aisles will be a sure turn-off ( can’t imagine navigating a stroller). The stalls are okay, but we’re talking food here…piles of fresh produce; hearing a minimum of 5 languages on both sides of the aisles – customers & vendors; the Lebanese butcher selling lamb, goat; the German butcher selling myriad sausage varieties; the Italian butcher with their salumi & much more. It’s public market lite; they mean well but I’ll hold my memories of the West Side Market, or the Harrod’s Food Halls, in London or the Florence Market in Italy. Yep, that’s why I’ve always liked this place…Judy, Geoff, Corla, Sharon, Rick (and many), many more here. We’ve done some great things together here-volunteering, organizing & making this community wonderful…all for ‘free’, even ‘profiting’ the City, the Schools, etc…all with no ‘commissions’ or payment & all for ‘the public, our neighbors’. It’s nice to hear again that ..there are actually lots of neighbors who will ‘tell it like it is.’ Thanks again Judi, for your reviews (and those who reply-it would be wonderful if this site had ‘agree’ or ‘disagree’ symbols that visitors could agree with) & the OB rag for recording them! Geoff has a troubled view. I my mind people are not stratified, cubby holed or segregated. People are very diverse, good thing, have unlimited choices, another good thing, and need not be judged by others. Commerce is a wonderful judge. People will support a nice idea or not. Good ideas will survive regardless of patrons status. As for the market, I haven’t experienced it just yet but will. Experience vs cost = value. Return experience decided upon reflection. Liberty Station would be the perfect location for this. I fear that we have a multitude of layered laws, regulations, permits, etc that would never allow such a great thing to be realized in our city. The market had to run this gauntlet just to get underway. I’m so grateful to have the choice to go there or not. Mr. Cloughly, If you reread what I wrote, you will see that I was not judging anyone, I was giving my opinion of the place. There is no trouble in my view, I just call it as I see it and I surely don’t expect everyone to agree with me. And, all of the other markets folks talk about, like the one you mentioned, are in the center of cities, like the Philly market, not contained in an artificial creation like Liberty Station. Now, one of these in downtown San Diego would be a great idea. Sad that Ms. Curry, as a “restaurant reviewer” and “foodie” had to slam the place a week after it opened. And was unable to give any food a try…only to complain mostly about the pricing. 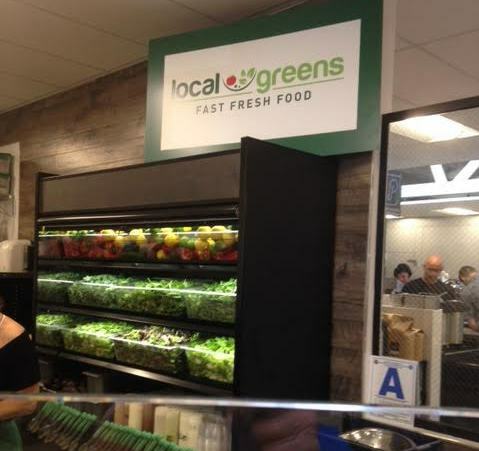 As noted by other commenters, there are ample choices in Liberty Station as well as the surrounding areas for food, and groceries at all levels of pricing and quality. Seating is available as well had Ms. Curry walked through the restaurant Mess Hall. I have been there numerous times and while crowded, and with opening kinks with the various vendors (e.g., not enough help or product, etc. ), the place offers specialty products (fresh, house made sausage, or a vast array of cheeses, for example) that is nice to have in this area. For the cost of gasoline to get to a store further away, having them available close by is worth it. Traffic, yes, it is there, and parking at peak times, lunch, for example, may take a few minutes to find. With Stone and Fireside by the Patio open as well, and others such as Con Pane, Soda & Swine, The Women’s Museum will also be vying for parking.parking and that is something to be directed to McMillan. Wondering why it’s taking so long to moderate my comment. Marcie perhaps you did not read my statement that this article was my opinion and I knew people would agree and disagree with me. I didn’t “slam” the market. I reported it as I saw it. I was raised near the Farmers Market in Los Angekes. I went there as a child; I shopped there as a young mother. The one thing there was there was something for every income. There is not at LS market. I was disappointed because it was crowded beyond being comfortable ; if a fire developed it would be chaos trying to get out . Of course it was your opinion. As a restaurant reviewer, to fairly write about a place that has just opened, most writers wait at least a month before giving opinion. That way the place has time to work on the kinks that any place has when opening. 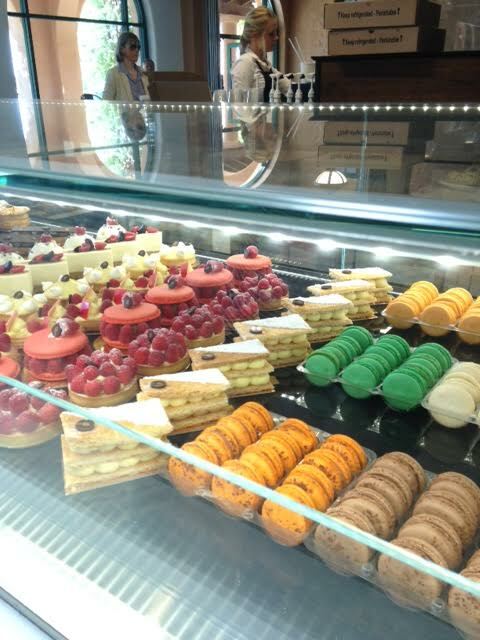 If there is anything I have learned in my many years writing about food and restaurants, it is to have no expectations before I walk into a place. The preconceived expectations can very much color how fairly or unfairly I write. In the case of the Market, I had no expectations, and was pleasantly surprised, albeit, as I wrote, there certainly are issues to be dealt with from traffic to vendors, etc. We’ve all been to markets we love, some we can’t stand…However if you’re looking for those many apple varieties you mentioned you saw at the Berkeley Bowl, I’m sure you could find a few here…at our many farmers markets or People’s. Let’s be clear: I did not slam you. I slammed your review. Nothing personal at all. If a restaurant cannot do it right on the first day, they should give food away until they CAN get it right. I never heard of a grace period until they get the bugs worked out. I am not commenting on the market because I have not been there yet. Stone had a “presale” where they contacted folks on their mailing list, took reservations and gave a 25% discount. You knew upfront they were working out any kinks. It was cool and kinda fun to be a part of the process. I also appreciate a locals discount…not sure if that happens anywhere on the Point but I have lived places where they really appreciate the locals business especially when vacationers are not abundant. I agree with your review! Not slamming anyone but I disagree with only reviewing a place after a month. I totally understand but first impressions are just that. I was so excited for this. Anaheim opened up their packing house and though this would’ve even better… Unfortunately the packing house is 2 hrs away and I’d rather spend my money there. Would I go back toLS yes! But only for certain things and not to just hangout:( where other markets I’d go shop drink eat and meet friends. The LS has a get in and get out feel with layout. I’m sure they will iron out kinks and it can grow and improve but I’m not currently seeing its potential to be like the reading terminal in philly or even the packing house in Anaheim. I will visit and see… Hope for better, but not expecting much. I hope to be proven wrong and pleasantly surprised. While this is definitely a tourist destination as well as a spot for locals I do not believe the pricing is out of line for this area. Especially when you have People’s Market thriving in OB and people applauding the opening of Jensen’s where Fresh & Easy used to be. 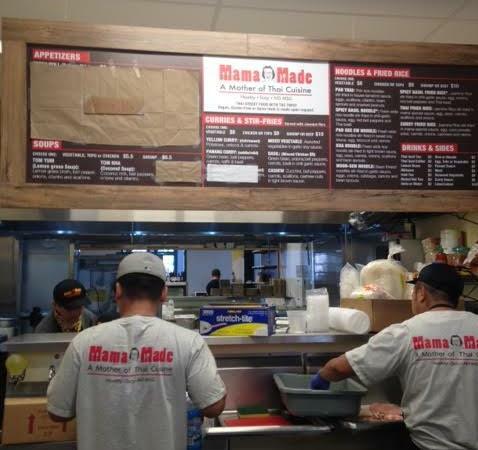 It is great to see the variety of goods/food being offered by local businesses (local to San Diego). Whether you like it or not, the OB/Point Loma area is going to keep on increasing in price in every aspect.